Carved into Musashi's Bokuto, Jisso Enman means, "Without adaptation"
The ceremony was opened by Colin Hyakutake-Watkin, a menkyo holder of the ryu with a ceremony of Honzan Shugenshu and Choken Batto Jutsu Kageryu. Various speeches were given by dignitaries welcoming the ryu back to Kokura. Among these was one by the present generation descendants of Musashi's son Miyamoto Iori. He spoke of the well documented history of Musashi living in Kokura. His third son was a retainer of the Lord Ogasawara Tadazane. As The appointed new Soke was a resident of Kokura it was the wish of the family that the hombu would now return to the family home of Kokura. |As for the past. One of the Menkyo holders Kiyonaga Fumio left the hombu to start his own group separate to Imai Soke back in 2004. Within that group was also the Taiwan representative and menkyo holder Chin Kin. Kiyonaga Fumio died in November 2008 preceding Imai Soke. The group then leaderless could not return to Imai Soke and sought recognition elsewhere. 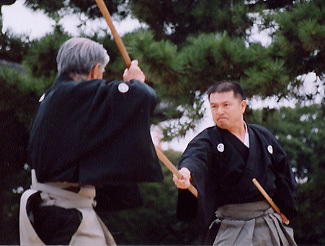 They turned to Gosho Motoharu a Shihan of the Sekiguchi ryu. The Sekiguchi Ryu who had previously been connected with the 8th Sohke Aoki Kikuo. Gosho Motoharu like many of us had previously assisted Imai Sohke. He can be seen on old Nippon Budokan video with Imai Sohke. He also assisted Soke on an Australian seminar. Over the years many of us have had the priviledge to assist Soke myself included. But this does not automatically make me a successor. Obviously the only person that can designate a 12th successor is the 11th one. If every assistant became a Soke? We would have 50 Soke by now. At that particular time I was Kocho Bucho of the ryu. I feel that I should post details online to make the matter clear being one of the only people that was privy to to what took place. My other reason for doing so is remembering how devastated Soke was when his trusted Menkyo kaiden left the hombu. Also I am disgusted at the disrespect that has been shown to Soke since he passed away. A distinct lack of Budo Seishin that leaves one wondering why some even bother to practice and study Musashi's philosophy. Succession in the Hyoho Niten Ichiryu, the name designated by Musashi towards the end of his life does not follow a hereditary pattern. It is attested by artifacts, Scrolls of the ryu and the Jisso Enman no Bokuto. And above all a lifetimes teaching of the physical attribute and education in Buddhism and deep understanding of Musashi's mu. Throughout the generations certain students have also been acknowledged by previous Soke during their life leading towards the final choosing of a successor. They have perhaps gone away or the Soke has moved on with contact being broken. In some case this group can remain as a 'ha" or family group of the original ryu. This has no bearing as to who is chosen in finality to continue a line. 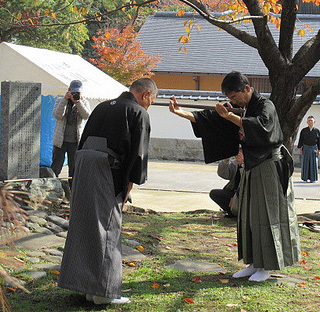 To this day the area is has been used for embu and ceremonial purpose of the Ryu. With relation to the above picture on 24th of November 2013 a new succesor and 12th Soke was appointed. The new and official 12th Soke is now Kajiya Takanori. With relation to establishing a Ha: I had been taught exclusively by the 10th Soke along with the 11th.The 11th soke told me I could continue on my own with my own Ha if I wished to practice as the 10th Soke had taught me. I respectfully declined for various reasons. Over the years a Ha can become fragmented until it no longer resembles the original ryu and lacks authenticity As it is I see few people, even in Japan that have an interest in Koryu. Why split thing even more. First and foremost is giri, ones duty and obligation to ones chosen leader. If that goes out of the window in koryu I see little point in continuing. Most of all a ryu is living tradition. To be promulgated by both juniors and seniors alike. After all its not something we can do on our own! Musashi's wish was to perpetuate his art to three sucessors among a thousand students around 1640. To Terao Magonojo, his younger brother ky Kyumanosuke and to Furuhashi Sozaemon. He considered Terao Magonojo to excel in technique but lack in reflection. Furuhashi Sozaemon excelled in reflection but lacked technique. Magonojo recieved the Gorin no Sho on the instructions that he should read it and burn it. borrowed it fora few days and on the the orders of the Lord Hosokawa Mitsuhisa he made two copies. One for Hosokawa and one for himself that he transmitted under the name of Ihon Gorin no Sho. The best known artifact today is the Hosokawa copy. After the death of Musashi Terao Magonojo appealed to Miyamoto Iori to take over the ryu. Miyamoto refused saying it was his father wish that his student should become the new leader. Terao Magonojo later yielded the role of succesor to his younger brother Terao Goemon who had recieved the Hyoho san from Musashi. It was Goemon that transmitted to his students this document with seven added instructions called the Hyoho Shiji ni Kajo. In memory of the last three Soke. The Soke tradition will continue unless a new one sees fit to alter the line of succesion by Menkyo Kaiden or other means. Sadly a leader sometimes puts their trust in other peoples integrity. 0ne does things with purest intention without considering the hidden agendas of others. Let us also hope that future Soke respect their Sensei's teachings and not change ryu into something it is not!